We have online facilities through our own intranet networking system connected with all branches to share our back office software. We can provide all services from any of our branches. We have sufficient trading terminals with full screen multimedia projector in each branch to provide trading services to the customers. Our customers of one branch can trade in any branch along with obtaining necessary reports such as trading confirmation, financial ledger and portfolio statement etc. We have updated Network Technology for Share Trading and to manage our Client Management Software. 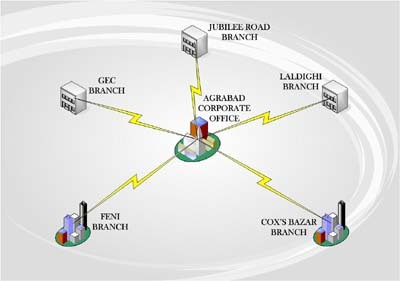 We use different VLAN Connectivity for performing all activities in all branches to ensure timely and quick service to our clients (Such as: Trading, CDBL and Private Network).